2019 shapes up to be a critical year for public transport workers in Victoria, with the Enterprise Agreements (EA) for all three major operators (Metro Trains, Yarra Trams and state owned regional rail operator V/Line) up for expiration and renegotiation. This piece will mainly attempt to provide an in focus look on the state of play at Metro Trains, but there are obvious parallels between the negotiating scenarios at all three major operators. The fight around the last EA in 2015 was by far the most bitter and protracted by rail workers against the network operator since the franchising out of the network occurred under the Kennett government. The Metro consortium, which is majority owned by Hong Kong rail operator MTR, with minority stakes held by Chinese controlled infrastructure firm John Holland and Australian maintenance firm UGL, fought a bitter battle to strip rail workers of many conditions long hard fought for and won over many years around issues such as driver training, long standing overtime arrangements, staffing levels and in particular, trying to institute 24 hour running on weekends (a great change to the working routine and conditions to all workers involved) without anything near adequate compensation. 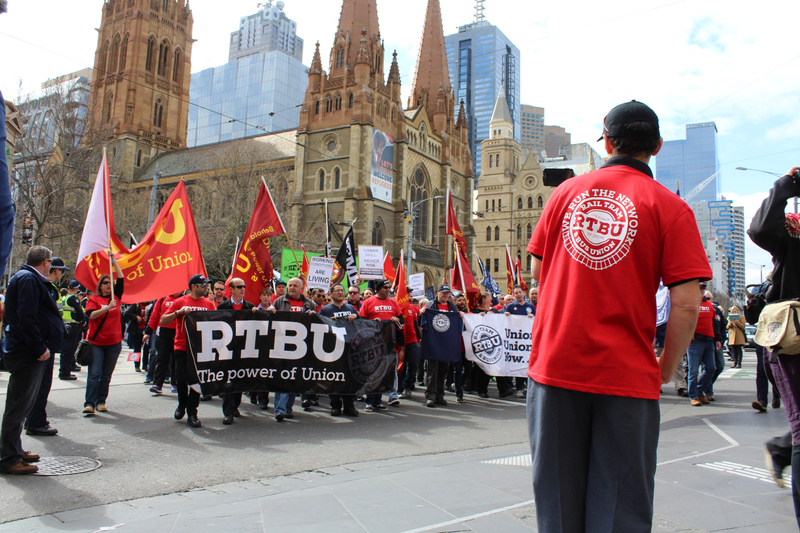 Spurred on by strong fighting sentiment from rank and file workers and delegates, the RTBU went on to call the first public rail strike action in Victoria since 1997. Despite attempts by management to isolate and divide different sectors of the workforce, the rank and file stood united, as did their colleagues from Yarra Trams, who in the face of similar attacks from their management stood tall and fought back. Both operators were forced back to the table and much more satisfactory agreements were eventually agreed covering the next four years. A lot has changed in the intervening years since the 2015 agreement was ratified however. In spite of what was quite honestly a half hearted campaign by the RTBU for the return of the rail franchise to public hands, MTR were awarded the right to run the system until 2024. This fact in itself presents an interesting truth; many expected a Labor government to seriously consider the return of the system to public hands, not to a foreign company running the system for profit. The fact that it was never even considered is just another prime example of the ‘progressive’ Victorian ALP operating as a business as usual government for their foreign capital cronies. Emboldened by the sweeping mandate to operate the system for almost a decade, it didn’t take long for MTR to test the resolve of the rank and file workers on the ground. In a test case in early 2018, without consultation, management announced the removal of all control desks on the Clifton Hill group, rationalising this safety critical equipment and role to one operator out of the city control centre. This would have resulted in the shedding of at least 20 jobs alone. After a concerted campaign by rank and file frontline workers and delegates, the company was forced to back down on this blatant attack on it’s workforce. Very recently, the official negotiating period for the EA for the period 2020 and beyond has begun and the statement of intent from the company has been very clear. The direct communications from the management to employees have brazenly set the scene for what is to come. Constant references to the need for the business to ‘manage costs’ and above all provide greater ‘flexibility’ within the workforce to meet the ‘requirements of running a modern railway’. As has been obvious for a while, this language looks to be referring to an attempted erosion of the rights that have been held onto so long, as well as the introduction of a wave of casualisation across an industry that has so far been largely insulated from that particular scourge. The same pushes are occuring at Yarra Trams and V/Line. Whilst V/Line is state owned enterprise, it operates on much the same terms as the private operators and will be seeking the same objectives. As much as there is a challenge on the hands of workers across the industry, with all three agreements expiring at the same time, it is imperative that workers across all three businesses form links and look to coordinate their actions as much as possible, something that has been lacking in the past. If proper coordination of both strategy and action is achieved, this challenge can be met head on and in fact, turned into an opportunity to not just defend the gains of the past for workers in the industry, but in fact get on the front foot and forge forward new advantages.